Enjoy stunning colors and elegance in any room with tile flooring installed by our dedicated and knowledgeable team. Adding a tile floor to virtually any room is a great way to increase your home’s real estate value, refresh the appearance of an outdated room, or improve a family member’s allergy and asthma symptoms. With tile flooring installation by our flooring specialists, you’re able to enjoy high-quality, durable tile floors for many years to come. From its hypoallergenic nature to its easy maintenance requirements, tile flooring is a great option for any home. Whether you’re going for a classic or modern look, there’s a tile style to suit your tastes. 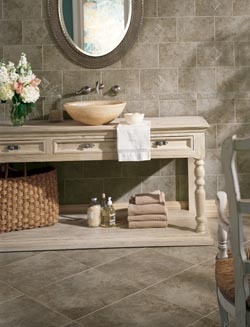 We carry tiles in a full range of colors and materials by popular manufacturers like Floorcraft™ and Star Values™. These reliable and trustworthy brands are sure to provide you with years of aesthetic and functional value. With so many options to choose from, you are sure to find the floors that suit your needs in looks, performance, and price. In your busy and exciting life, it’s important to have a durable tile floor that can stand up to high levels of foot traffic, dropped items, and exposure to moisture. Ceramic and porcelain tiles are highly water resistant, making them ideal for rooms like the kitchen and bathroom, which are frequently exposed to spills, standing water, and humidity. Many people also choose to use tile in their home’s entryway and even outdoor areas like swimming pools and patios. Ceramic tile is a durable, heat and cold-resistant material, making it perfect to use outdoors. If you have an outdoor patio area or swimming pool, using water-resistant ceramic tile for your flooring is a great option because it is water-resistant and doesn’t crack, warp, or shrink when exposed to extreme temperatures. This makes it an ideal material to use outdoors. Its durability means you’re able to use patio furniture on it without having to worry about chips or cracks. Tile flooring installation requires precision and special equipment, so make sure you leave it to our skilled and experienced professionals. After exploring our selection of colors and styles, choose a tile that matches your taste and budget. Schedule an installation by our team of skilled professionals and ensure that your investment is protected. We make sure your beautiful new flooring is installed straight and level, properly sealed for maximum moisture resistance, and structurally sound. For homeowners who don’t have much time to dedicate to floor maintenance, tile flooring is a great option. It doesn’t require intensive steam cleaning or vacuuming and can be cleaned with a mild detergent and cleaning materials like cleaning rags or chamois towels. Our selection of ceramic, porcelain and vinyl tile offers you a wealth of choices when it comes to the design and appearance of your rooms. Modern technology allows manufacturers to create a variety of tile designs, colors, and textures. From a natural stone look to tiles with the appearance of hardwood, we carry a full range of styles suitable for any room. Enjoy the beauty, versatility, and easy maintenance of tile floors that look and function well in any room inside or outside of your home. Whether you’re remodeling your dining room to look more elegant, updating your bathrooms with floors that radiate underfloor heating better, or you’re creating a stylish outdoor patio area, stone tile flooring is an ideal material for any area. We carry some of the highest quality flooring available from trusted manufacturers like Floorcraft, so you know your new floors will last for many long years. Visit our showroom to take a look at our selection, discuss your project with a design expert, or schedule expert flooring installation for your new flooring investment. Contact us when you’re ready to invest in your new tile flooring. We proudly serve the Ann Arbor, Ypsilanti, Plymouth, Brighton, and Jackson, Michigan, areas.